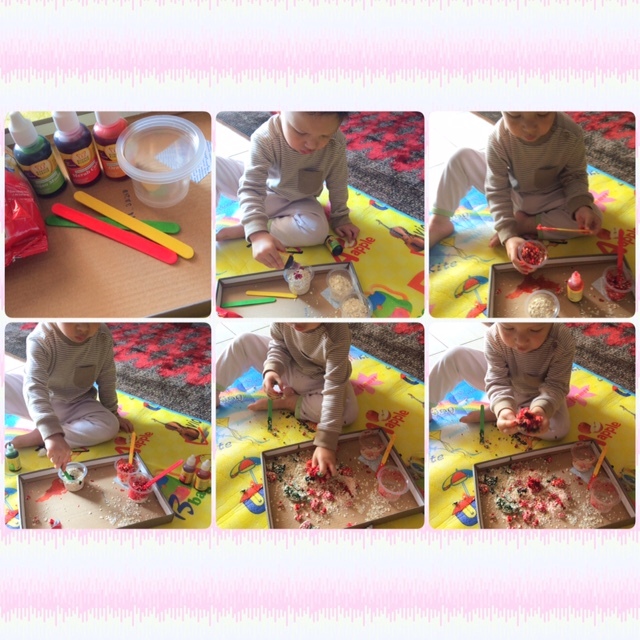 It is a fun activity that you can do with your kids, they will love it, especially when they can get messy during the activity. So how did we make our colored sand? Or in my case, we’re making a colored oatmeal, that will work too. Add around 15-20 drops of food coloring. Stir it until you get a nice crumbly texture. This is a great task for bilateral hand coordination. The kids use their non-dominant hand to hold the cup and their dominant hand to stir. Pour the crumbly textured paint onto cardboard and let them play with it (to press, squeeze, squash, and crumble up again) this is also good for their language development, when they feel the crumbly textured they will learn new words to express it.